Rizzo walked with the bases loaded in the seventh inning after Jason Heyward broke up a no-hitter with a two-run single in the sixth, and Chicago beat the Washington Nationals 3-2 on Friday. 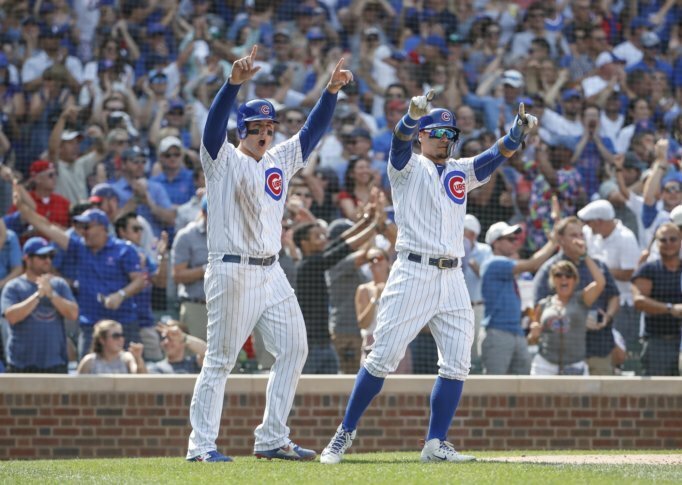 CHICAGO (AP) — Anthony Rizzo walked the Cubs to a wild victory. In the first meeting between the teams since they beat Washington in the NL Division Series, the Cubs won even though they didn’t get a hit against Nationals starter Jeremy Hellickson. Heyward finally broke through against Sammy Solis (1-2) with two outs in the sixth. But just as big was Rizzo walking three times. He sparked the tying rally with one in a 13-pitch at-bat before forcing in the go-ahead run with another in the seventh. Manager Joe Maddon got ejected, but the Cubs pulled out the victory. Hellickson retired 17 in a row after issuing a leadoff walk to Rizzo in the first. But things took a wild turn with two out in the sixth. He walked Rizzo on 13 pitches and both Javier Baez and Ben Zobrist on four to load the bases. Heyward took two balls from Solis before lining a tying two-run single past second baseman Daniel Murphy. Chicago grabbed a 3-2 lead in the seventh after Maddon got tossed for arguing an interference call against Willson Contreras on the bases. The Cubs thought they had runners on second and third after Kyle Schwarber led off with a single and third baseman Anthony Rendon’s throw sailed down the right-field line. Instead, he got called for interference, leading to Maddon’s second ejection this season. He argued with plate umpire Bill Miller and went to first to demonstrate his point that first baseman Ryan Zimmerman could not have caught the throw, anyway. Schwarber had to go back to first. But he eventually scored when Greg Holland walked Rizzo after Ian Happ and Addison Russell singled to load the bases, putting the Cubs on top. Kyle Hendricks gave up two runs and eight hits in six innings for Chicago, and five relievers combined to hold the Nationals scoreless the rest of the way. Steve Cishek (3-1) struck out the final two batters in the seventh. Carl Edwards Jr. got three outs in the eighth after former Washington pitcher Brandon Kintzler walked the first two batters. Contreras picked Juan Soto off first from his knees before Mark Reynolds flied out and Murphy grounded out, and Pedro Strop worked the ninth for his ninth save in 12 chances. Hellickson gave up two runs, walked four and struck out three. Murphy had three hits and a run, but the Nationals came up short after a 7-3 homestand. The Cubs signed veteran left-hander Jorge De La Rosa and transferred righty Yu Darvish to the 60-day disabled list to make room for him on the 40-man roster. Chicago also optioned left-hander Randy Rosario to Triple-A Iowa to create a spot for De La Rosa on the active roster. Nationals: OF Bryce Harper was back in the lineup after being scratched from Thursday’s game against Atlanta because of a sore right knee. … Martinez said RHP Stephen Strasburg (cervical nerve impingement) is scheduled for about a 60-pitch bullpen session Saturday and will pitch in a simulated game on Wednesday. Martinez said he thinks Strasburg will need to go on a minor league rehab assignment before returning to the rotation. … RHP Erick Fedde (shoulder inflammation) threw in the bullpen in the bullpen on Friday. Cubs: The Cubs plan to have Darvish — sidelined since May 20 because of triceps and elbow injuries — throw at least one more simulated game before going on a minor league rehab assignment. … Ben Zobrist (sore hip) started in right field after missing Wednesday’s game at Kansas City. Nationals: RHP Tanner Roark (6-12, 4.21 ERA) looks to win his fourth straight start. Cubs: LHP Jon Lester (12-4, 3.44) hopes to return to form after going 0-2 with an 8.53 ERA in his past four starts.